It’s comfort food and pumpkin season which means the occasional indulgence of Stovetop Pumpkin Mac and Cheese with Kale and Crispy Shallots. #StretchyPantsOn There’s no roux to make, just a creamy sauce base that includes heavy cream or homemade cashew milk, pumpkin, and cheese. For purists, I argue the sneaky pumpkin and kale are easy to include and provide additional benefits, texture and flavor in this pumpkin mac and cheese. Pile on a sprinkle of crispy shallots and this easy mac and cheese recipe is elevated to super star status! Start with a shallow sauce pot, olive oil and a large shallot. Slice the shallot thin while the olive oil heats to shimmering. Toss the shallots in the oil and fry for about 7-9 minutes. Drain, reserving that now fragrant olive oil (sooo good in salad dressings or a drizzle in soup) and set the shallots on a paper towel to dab off any excess oil. They’re now ready to use! Now we’re ready to make the stovetop pumpkin mac and cheese! I prefer to use a Dutch oven for a lot of my stovetop cooking, regardless if the dish is going into the oven. So I make stovetop mac and cheese in one too, but any medium sauce-pot will do. This simple mac and cheese recipe without flour can be made in one pot. Non-stick is especially helpful here. Cook the pasta until al dente’. Two minutes before the pasta is done, plunge the kale in with the pasta (double duty). 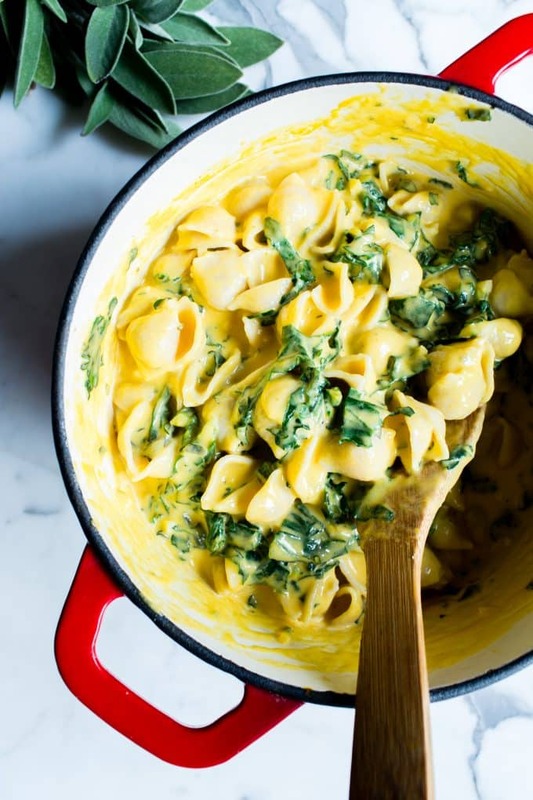 Remove the kale to cool, drain the pasta. 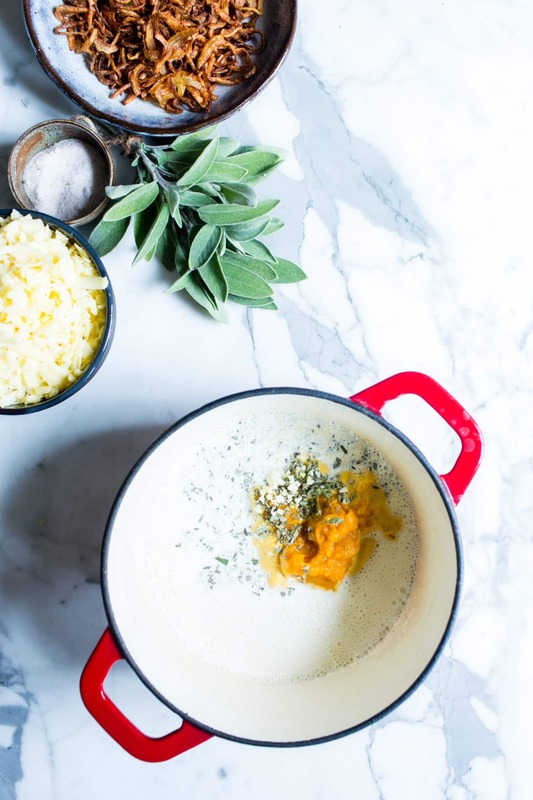 In the same pot, whisk whole cream or unsweetened Homemade Cashew Milk, pumpkin, garlic and herbs. Stir until just steaming and starting to bubble. Remove from heat and s l o w l y, a small handful at a time, whisk in the cheese. Add a new handful after the one prior has completely melted. Do not attempt to rush this (get in my belly) or the sauce could break. Return pot to stove on lowest heat to finish melting the cheese, add a few dashes of Tabasco or vegetarian Worcestershire and rewarm for a few minutes. Chop the kale, stir it into the cheese mixture, add the pasta, salt and stir to combine. Lid on and warm through, on low heat. 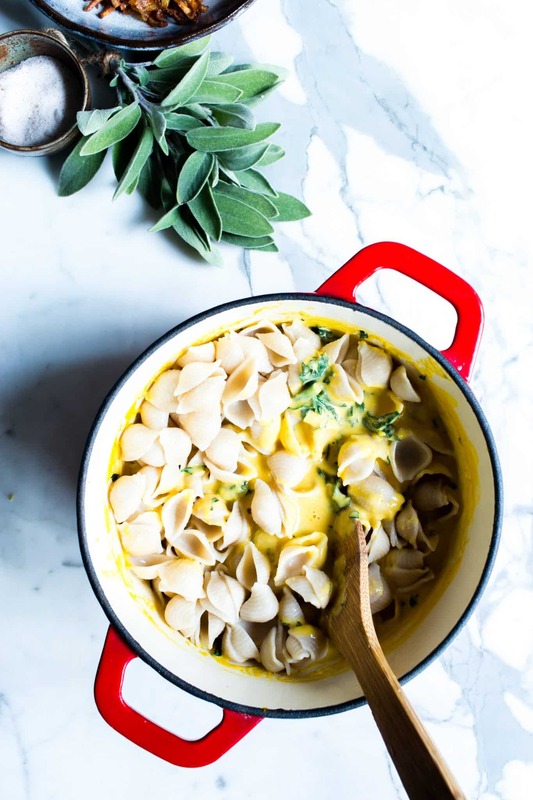 This stovetop mac and cheese is so simple and comes together quick! The key, is low heat and s l o w addition of cheese. Homemade Cashew Milk or Heavy Cream? Homemade Cashew Milk, you ask? It’s a perfect parter for this recipe. Unsweetened, its flavor is neutral and my Homemade Cashew Milk recipe (made without the sweeteners) provides enough fat in this recipe to stabilize the cheese sauce. I always have it on hand, so it’s what I typically make stovetop mac and cheese with. However, I’ve also made this with half n’ half and heavy cream. Half n’ half, I’ve learned, doesn’t work because there’s not enough fat in it to stabilize the sauce. 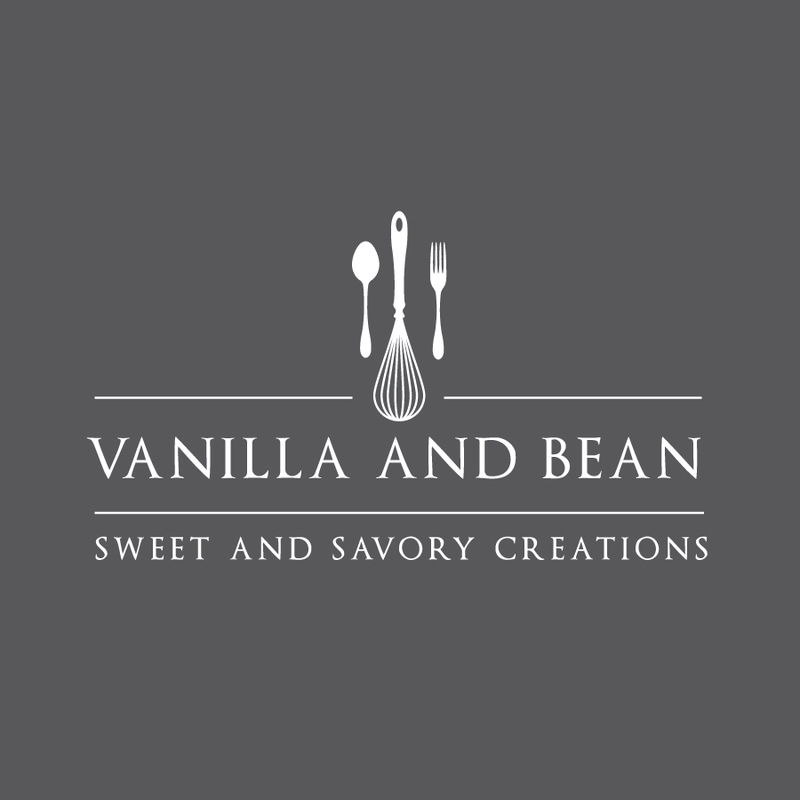 Heavy cream, on the other hand, works beautifully. Can I use Store Bought Nut Milks or Lower Fat Dairy? I wouldn’t try it. Most store-bought nut milks are mostly water, and wouldn’t provide enough fat to stabilize the sauce. Also, lower fat dairy wouldn’t provide the necessary fat to bring this sauce together either. My experience with half n’ half wasn’t so pretty. What is the Best Cheese to Use for Stovetop Pumpkin Mac and Cheese? This comes down to flavor preference, but I find cheeses that melt easy and pair well with pumpkin to be best for this easy stovetop mac and cheese. Be sure to buy block cheese and shred your own. It melts easier, is more economical, there’s less waste and it doesn’t have added anti-caking ingredients. White Sharp Cheddar is my favorite for this recipe. It melts easy, preserves the color of the pumpkin and I love its flavor. I use Organic Valley Raw Sharp Cheddar. One 8oz package is all you need. Gruyere would be my second choice. It adds a little grown up flair to your mac and cheese. It’s salty, melts beautifully and has a unique sharp tang. I mean, just check it out in this Grilled Cheese. It’s fabulous with pumpkin too! Gouda is a fine melty cheese for pumpkin mac and cheese because of its creamy texture, and mild flavor. I like Roth Organics. For a little smoky boost and grown up flavor, try Smoky Gouda with a dusting of smoky paprika over the top. There are many cheese combinations to try too. I used a combination of cheeses in this Roasted Cauliflower Mac and Cheese. Next, I’ve got my eye on pepper jack! Play with the flavors and see what curls your toes! Making crispy shallots is simple enough, but those last few minutes are essential in keeping a close eye on them. They go from just perfect to over done fast. Reserve the olive oil after frying for a fragrant addition to salad dressings, soups, or sauces. It is fabulous! I prefer to use a 4 or 7 quart Dutch oven for a lot of my stovetop cooking, regardless if the dish is going into the oven. It gives me plenty of room to get the job done and the enamel surface cleans up with ease. So, I make stovetop mac and cheese in one too, but any medium sauce-pot will do. Use your favorite pasta in this easy mac and cheese recipe, gluten free or not. Since going gluten free, I’ve been lovin’ Jovial’s Organic Brown Rice Pasta shapes. 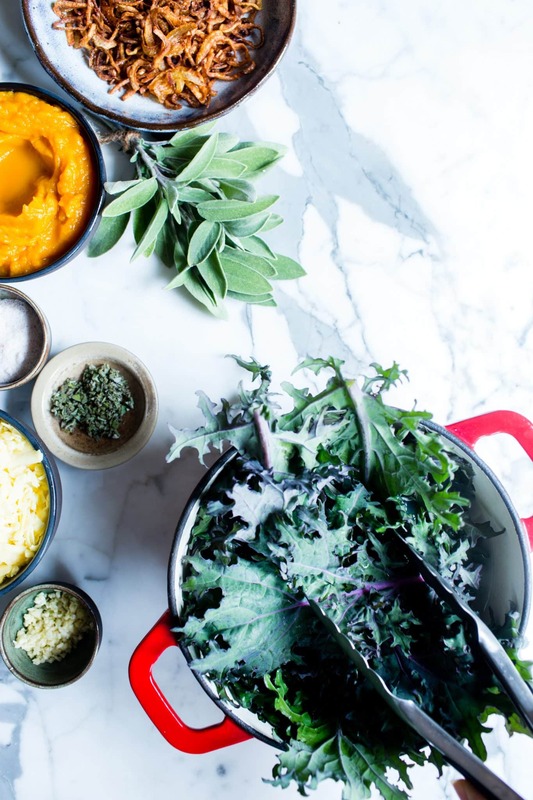 Cooking the pasta and kale together saves water and clean up. 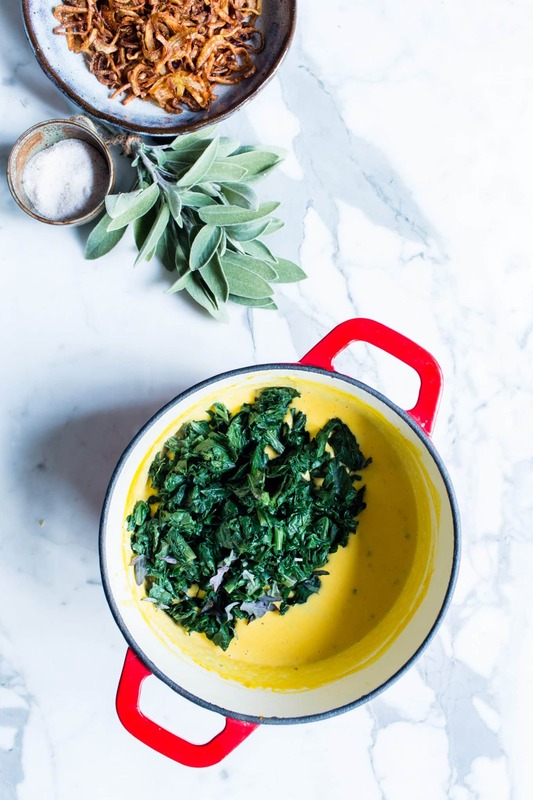 Simply plunge the kale into the pasta water about two minutes before the pasta is done. You’ll use tongs to fish out the whole leaf kale, allow it to cool, chop, then add it to the sauce. 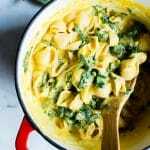 Is stovetop pumpkin mac and cheese freezer friendly? Yes please! Freeze once completely cool, thaw overnight in the fridge and gently rewarm with a splash of milk, lidded and on your lowest heat setting. 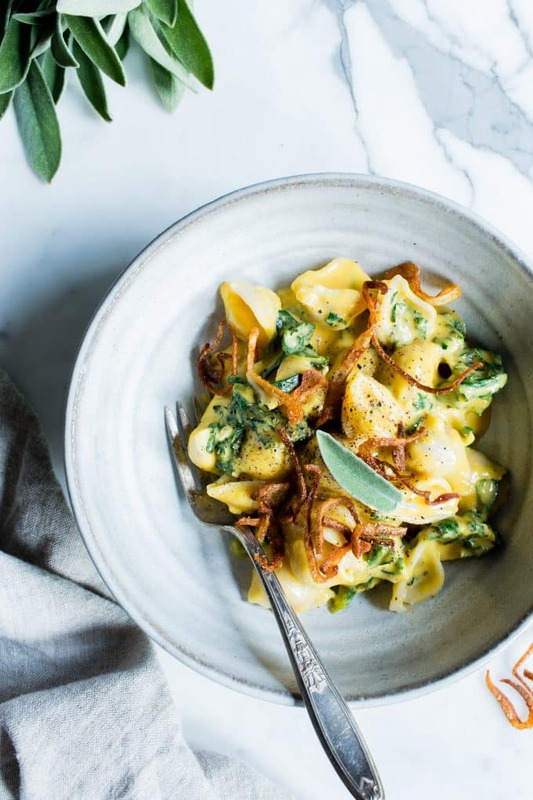 Flavor packed and texture rich with sneaky veggies, Stovetop Pumpkin Mac and Cheese with Kale and Crispy Shallots comes together quick and is freezer friendly. 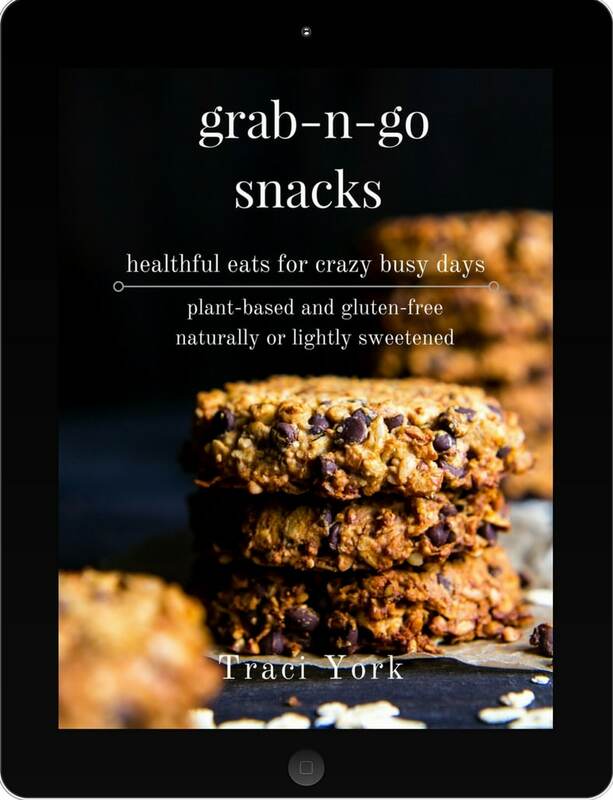 | vegetarian and gluten free optional *Read the notes in the blog post above for more tips! In a shallow sauce pot, add the olive oil. Heat on medium to medium high until the oil shimmers. To see if the oil is ready, toss in a slice of shallot. If it starts to fry, the oil is ready. Toss the shallots in the oil and fry for about 7-9 minutes stirring occasionally with a fork to loosen the shallots. Turn the heat to medium low, keep frying and keep an eye on them. When they start to evenly turn golden brown, remove from heat. 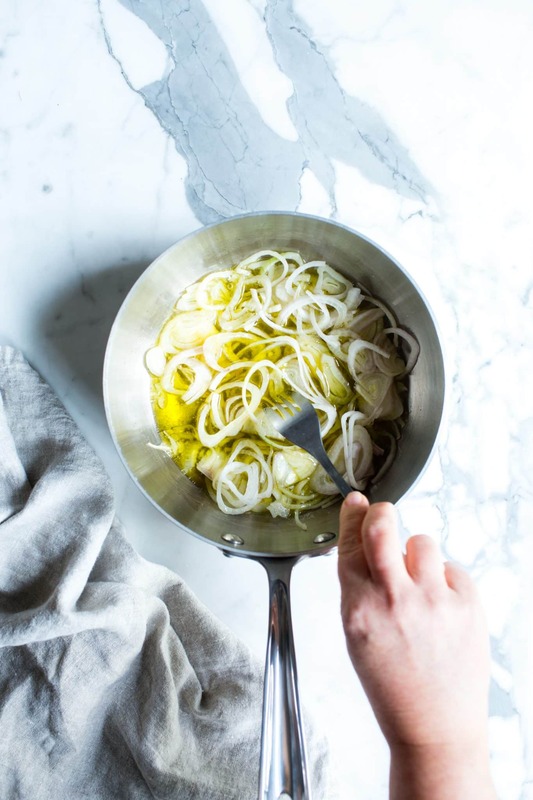 Drain through a fine mesh sieve, reserving that now fragrant olive oil (sooo good in salad dressings or a drizzle in soup) in a glass jar and set the shallots on a paper towel to dab off any excess oil. Sprinkle a pinch of salt over the top and set aside to cool. Store in a lidded container. They are best enjoyed on the day made. In medium Dutch oven or stock pot, fill with water to 2/3 full. Add a generous pinch of salt and cook the pasta according to package directions. 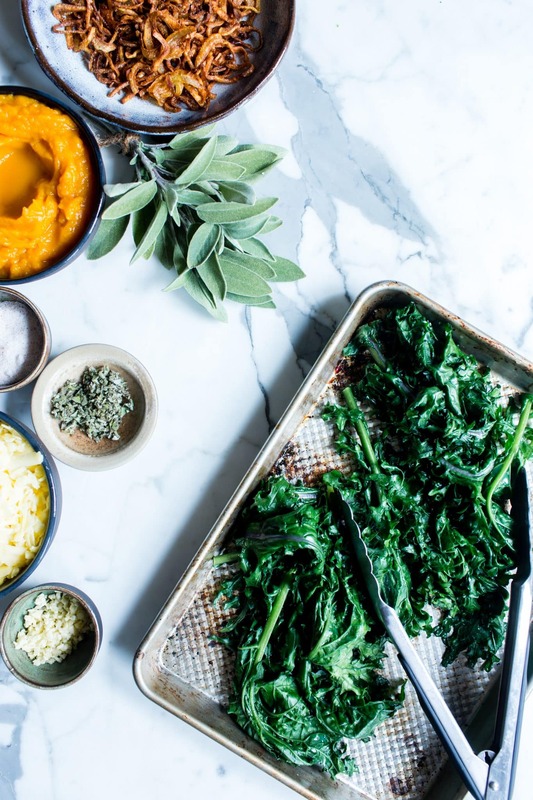 Two minutes before the pasta is done, using tongs, plunge the kale into the water and cook for those two last minutes. Fish out the kale using tongs, and set the kale on a plate to cool. Drain the pasta, set aside and dry out the pot with a kitchen towel. 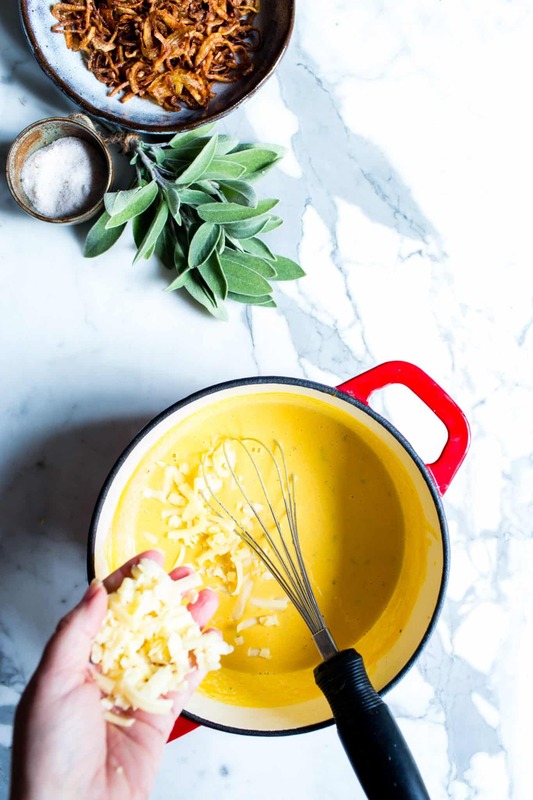 In the same medium Dutch oven or stock pot, whisk together the Homemade Cashew Milk or cream, pumpkin, garlic and sage or thyme. Heat on medium-low heat until the mixture starts to bubble and steam. Remove from heat and slowly, one small handful at a time, gently whisk in the cheese. Add more just when the previous handful of cheese has melted. Once all the cheese has been added, put the pot back on the stove, turn the heat on to the lowest setting and stir until that last handful of cheese has melted in and the mixture is warmed through, about 3-4 minutes. Meanwhile, squeeze as much water as you can out of the kale, and chop it into bite size pieces. Add it to the sauce along with the salt and Tabasco or Worcestershire, stir then, gently stir in the pasta. Taste for salt and Tabasco or Worcestershire adjustment. Lid the mac and cheese and warm thorough on lowest heat for just a few minutes. If the mixture seems to thick, add a splash or two of milk to loosen it up a bit. Spoon into individual bowls and sprinkle with crispy shallots. Store in a lidded container for up to three days in the refrigerator. Rewarm on lowest heat, lidded with a splash or two of milk to loosen the mac and cheese. Freeze for up to two weeks. Thaw in the refrigerator overnight. If you find somehow you're in broken sauce territory, Food 52 has lots of helpful tips! Recipe inspired by Cafe Flora Cookbook. Crispy Shallots adapted from Epicurious. You have mastered comfort, my friend! And anything with crispy shallots… gets my attention every time! 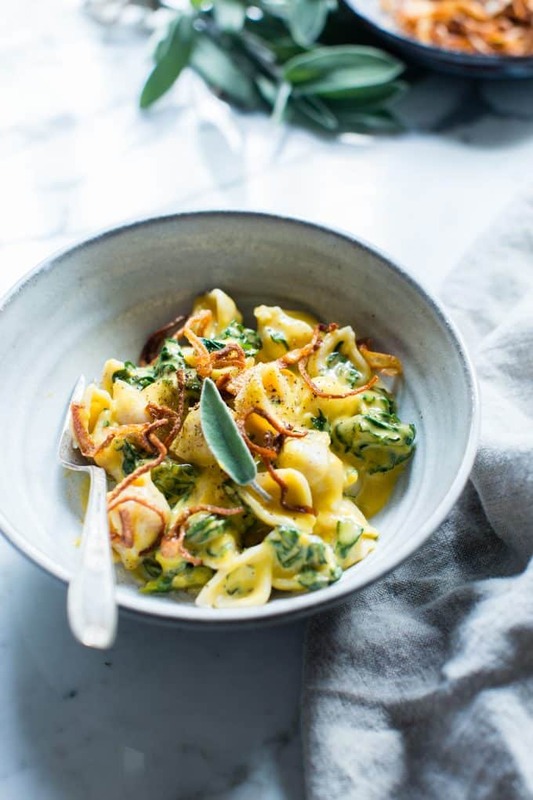 I’ve pinned your wonderful looking and sounding pasta dish and can’t wait to give it a try. I don’t think it gets more comfy and cozy than this! Such a dreamy meal. Also, so sad that most store-bought plant milks are mostly water. If only we subsidized nuts as much as we do dairy then maybe they would be more affordable and companies could use more of them! You know me Traci! My stretchy pants are on and ready. January will come soon enough, so I’ll enjoy this mac and cheese while I can. I love that you cook this right on the stovetop. So easy for those busy weeknights during the holiday season. I’m aboslutley loving those crispy shallots on top too! I wish I was at your house when you were making this! I love easy Mac and cheese recipes like this – yes to pumpkin and those crispy shallots are an inspired addition! Delicious, Traci. You’re going to love how easy this is, Geraldine! Mac and cheese is definitely comfort in a bowl. 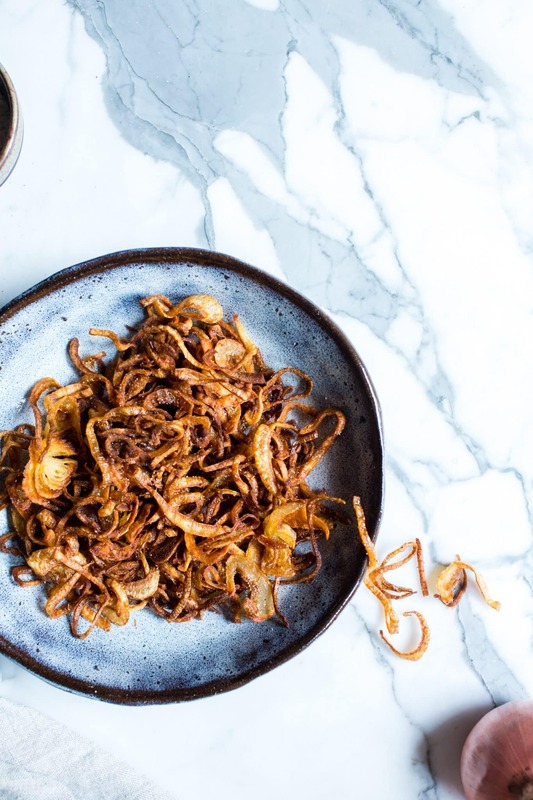 Those crispy shallots give it flavor and the crunch on top you would get from baking it-double duty! The kale and pumpkin make it a little less indulgent, too. Enjoy your woodland wreath…I’ll be making those all week at the arboretum where I volunteer…really puts me in the holiday spirit. Agreed, Jean! Double duty indeed…. thing is, bread crumbs are out for me (learning/trying to love GF bread crumbs :/) so I decided crispy shallots were in order! Love hearing about your volunteer work, Jean! That’s so fun! Haha… agreed! I love their contrasting notes and that texture (!!). I was reading a blog post and was shocked when I saw the date on it… almost two years ago. I feel like I just wrote it! haha! And that it was just winter, yesterday! OMGee ! This mac and cheese looks so delicious, Traci! Love the crispy shallots! Thank you Laura! They’re a nice contrast!